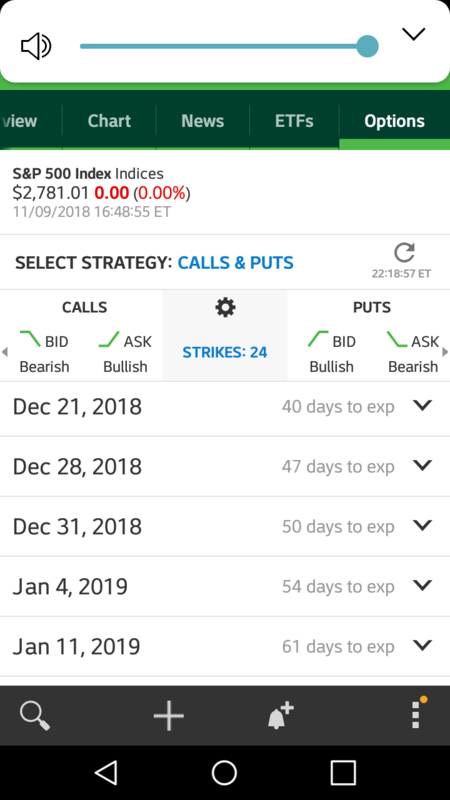 I have been having issues for awhile now, with SPX options calendar leaving out many dates. It's sporadic on which dates are missing though. 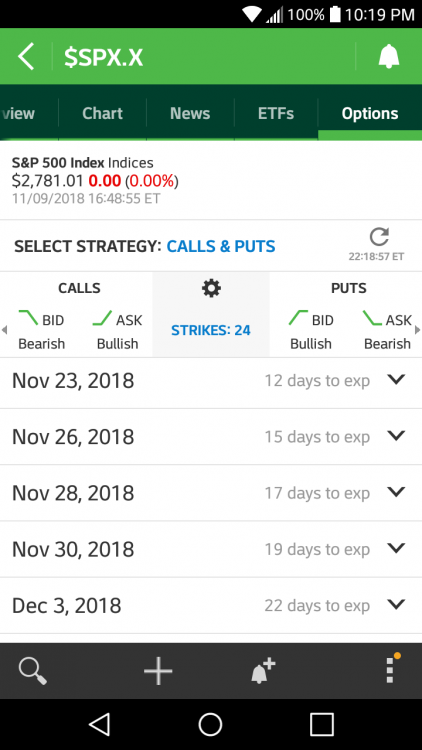 Since I like to trade weekly options from time to time, it's becoming a problem. I can see all the dates on my phone with TD's mobile app, and also in Think or Swim (which I hate...) but not in MT. I just checked on that the other day. It seems that TDA is not returning the options prior to 16th in the chain. will report. So I decided to try other data sources, and the option chain is still the same regardless. I'm not sure why. 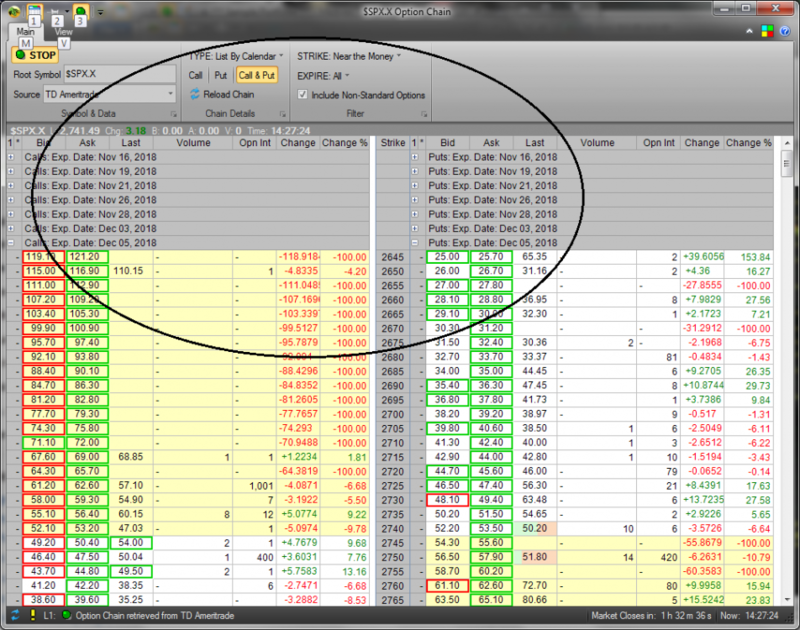 Any ideas on why weekly calendar for SPX is missing dates? I do like to trade "last day" or next day expiry, especially in volatility (as now). If I put in the symbol manually, such as .spxw_181114P2690 in the portfolio list, it'll track it fine. It's much easier to watch and track strike / price in the option chain real time though. 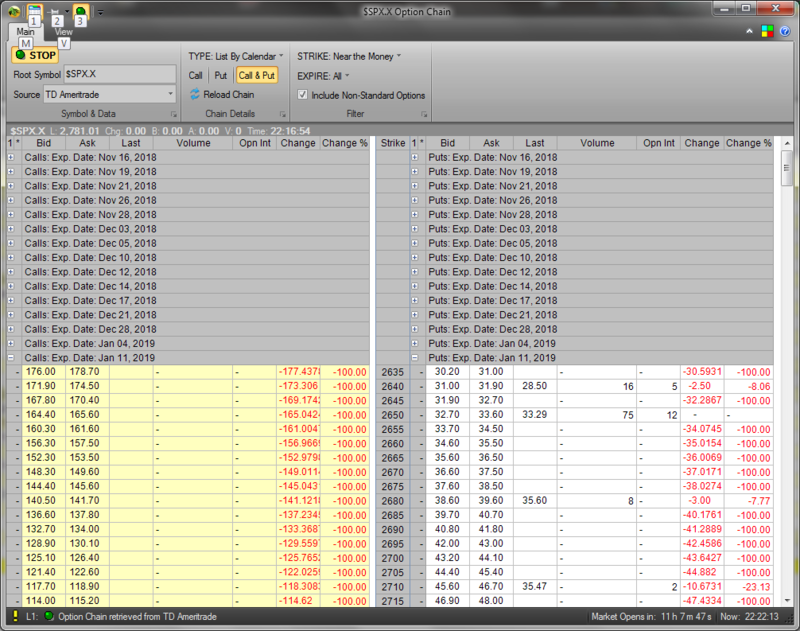 The option chain real time with the chain updating is one of the main features I use in the program to trade. Ok, didn't know that (refresh). I thought it did it automatically when connecting to another source. So, using Yahoo (since it's free and I don't have another feed besides TD) and refreshing, the dates populate. Here are screen shots from MT and TDA mobile app for comparison. There are many dates that are not populating. It's primarily weekly and end of month(s) that's missing. thanks for the details. reported it. got feedback. for the moment, if you get options on $SPXPM.X you will get the missing days. Issue started when they started to have AM and PM options. I will see if I can do something for to request both and merge them client side. But the above is a temporary fix. Weekly SPX option chain is messed up again. It was fine on Friday, this morning Jan 11's are the earliest calendar. Many intermittent dates are also missing. y, I reported that this morning to them. One of the requests for the option chain is failing. 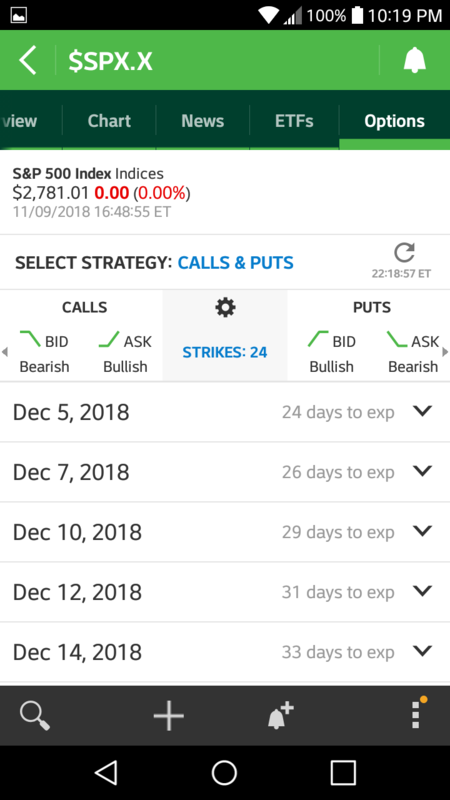 Jerry, any idea when the weekly option chain will work reliably again? It seriously hampered my trading today not being able to see and operate on last day SPX options. It's starting to really make me angry. I have not heard anything back from TDA about it. I sent a followup just now. Seems to be back in order working properly again. Didn't at 9:30 but right now it's showing all dates. Sheesh. I don't believe it's MT, I think it's TD A's data feed. If it continues, I'll just have to make some changes I guess. yes, I got through to the right person this morning and they had it fixed.